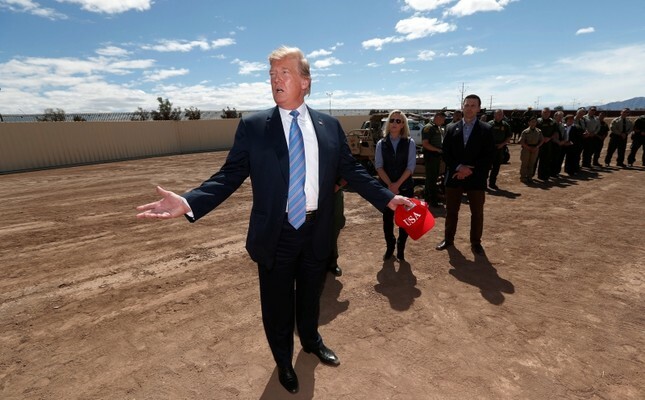 "There is indeed an emergency on our southern border," Trump said at the briefing, adding that there has been a sharp uptick in illegal crossings. "It's a colossal surge and it's overwhelming our immigration system, and we can't let that happen. So, as I say, and this is our new statement: The system is full. Can't take you anymore." As Air Force One touched down in the state, California and 19 other states that are suing Trump over his emergency declaration to build a border wall requested a court order to stop money from being diverted to fund the project. But Trump, who ratcheted up his hardline immigration rhetoric in recent weeks, declared that his move, which included vetoing a congressional vote, was necessary. Trump, who campaigned on a promise to secure the border, has thrown virtually every option his aides have been able to think of at the problem, to little avail. He's deployed the military, signed an emergency declaration to fund a border wall and threatened to completely seal the southern border. On Thursday he added a new threat, warning of hefty tariffs on cars made in Mexico if the country doesn't abide by his demands. Now, with the encouragement of an influential aide and his re-election campaign on the horizon, Trump is looking at personnel changes as he tries to shift blame elsewhere. The first move was made Thursday, when the White House unexpectedly pulled back the nomination of Ron Vitiello to permanently lead the Immigration and Customs Enforcement agency, where he had been acting director. The abrupt reversal was encouraged by top Trump policy adviser Stephen Miller and seen by some as part of a larger effort to bring on aides who share Miller's hardline immigration views. The president said he wanted to go in a "tougher direction." Immigration experts say Trump's own immigration policies have caused so much chaos along the border that they may be encouraging illegal crossings. The furor over family separations last summer helped to highlight the fact that families won't be detained for long in the U.S. if they're detained at all. And metering, in which people are asked to return to a busy port of entry on another day to seek asylum, may have encouraged asylum seekers to cross illegally, said Andrew Selee, president of the Migration Policy Institute, a non-partisan think tank. Whatever the reasons for the migrant surge, there is a growing consensus that federal border resources are overwhelmed. While illegal border crossings are still down sharply from their peak in 2000, they have nonetheless reached a 12-year high. And while most illegal border crossers used to be single Mexican nationals coming to the U.S. in search of work, more than half are now parents and children who have traveled from Central America to seek refuge in the U.S. In the meantime, tensions between agencies and at the White House have been bubbling up. At the Department of Homeland Security, officials have expressed frustration with colleagues at the department of Health and Human Services and at the Pentagon, accusing them of doing too little to help. And there are complaints about the White House and what some see as an effort by Miller to dismantle the leadership of the department, in part to shift the blame away from the White House.